Newman’s Own makes licorice, and it’s good! 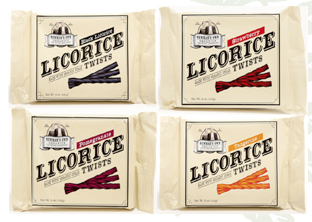 As you may have noticed, I’ve been on a licorice bender as of late…I don’t know what’s up, but I’m working through it…. Strawberry, Tangerine, Pomegranate, and Black are the 4 flavors offered. The package weighs 5 oz. and says it has 3.5 servings (really?). On the Newman’s own web site they list suggest retail at $2.99. The licorice twists are about 5 inches long and have a good chew when you bite down on them. Strawberry is by far my favorite flavor. The tangerine and pomegranate flavor are a little too subtle for me. The black licorice flavor is subtle, but pleasing. This is certified organic candy, and all profits go to charity, so you can feel good about eating 3.5 servings in a day. (But remember my previous post about the adverse effects of too much licorice). All in all I think this is a good product, I’d just like a little more flavor in the tangerine and pomegranate ones.